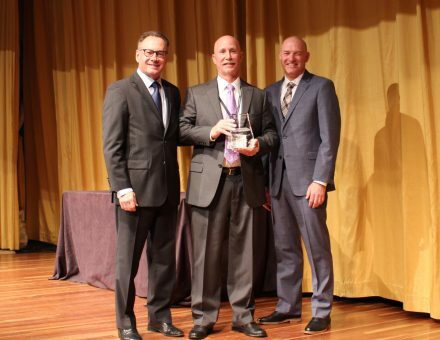 INDIANAPOLIS – Announced recently at Wheaton’s 64th Annual Partnership Conference in San Diego, All Brunswick Van Lines was awarded top agent honors as the Wheaton 2018 Agent of the Year. The award is given to the interstate agent for Wheaton World Wide Moving that exemplifies founder Earnest S. Wheaton’s philosophy of putting customers first and the characteristics of quality, professionalism, empathy for customers, fellow agents, drivers and Wheaton employees. Co-owner Steve Morgen of All Brunswick Van Lines (center) accepts the Wheaton 2018 Agent of the Year award in San Diego from Wheaton World Wide Moving CEO Mark Kirschner (left) and Executive Vice President A.J. Schneider (right). Owners Steve Morgen and Patrick Juarez started All Brunswick in 1986, and the company became an agent for Wheaton in 1988. During its time as a Wheaton agent, All Brunswick has received numerous sales and quality awards, as well as multiple Agent of the Month honors. All Brunswick’s professional staff of account managers, packers, loaders, warehouse specialists and expert drivers all have tremendous moving industry experience in residential as well as corporate relocation. Many of New Jersey’s largest employers are counted among All Brunswick’s corporate customer base. Wheaton Van Lines, Inc. is one of the world’s most highly regarded providers of transportation services. Wheaton Van Lines now owns three household goods relocation brands, Wheaton World Wide Moving, Bekins Van Lines and Clark & Reid. The van line is now the fourth largest household goods carrier. Headquartered in Indianapolis, Ind., the Wheaton, Bekins and Clark & Reid brands offer private and corporate domestic and international household goods relocation services as well as special commodities and logistic services. The United States Military also is one of the company’s largest customers. Wheaton Van Lines, Inc. is partner to approximately 330 Wheaton, Bekins and Clark & Reid agents nationwide. To learn more, visit www.wheatonworldwide.com. All Brunswick Van Lines is an interstate agent for Wheaton World Wide Moving. All Brunswick is one of more than 350 Wheaton household goods moving company agents. For more than 32 years, All Brunswick has lived up to Wheaton’s “customer first” philosophy while serving and satisfying customers throughout the state of New Jersey. © 2018 All Brunswick Van Lines All rights reserved.